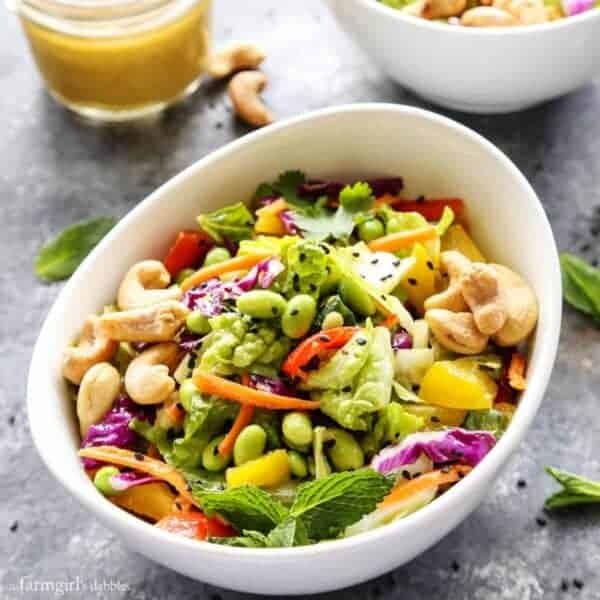 Fresh and vibrant, this Chopped Salad with Coconut Green Curry Dressing is one of my favorite ways to lunch! Fresh and bright and colorful always makes me happy, whether it’s a fragrant bouquet of flowers, a new summer dress, or a delicious dish on the table. And obviously, here for this post, I’m talking about food. Specifically, this Chopped Salad with Coconut Green Curry Dressing. Total happiness! * This is a sponsored post, created in partnership with Zyliss®. When there is lots of chopping, slicing, and dicing to be done, as this chopped salad recipe requires, a good set of knives is absolutely essential. Knives are truly my most used and appreciated kitchen tools. So when Zyliss asked me to give their new Zyliss Control knife block set a try, I was more than eager. The Zyliss brand was born in Switzerland in 1948. They started with a garlic hand press and have expanded their line over the years to include graters and slicers, choppers, food storage, a large variety of gadgets and tools, and of course knives and cutlery. 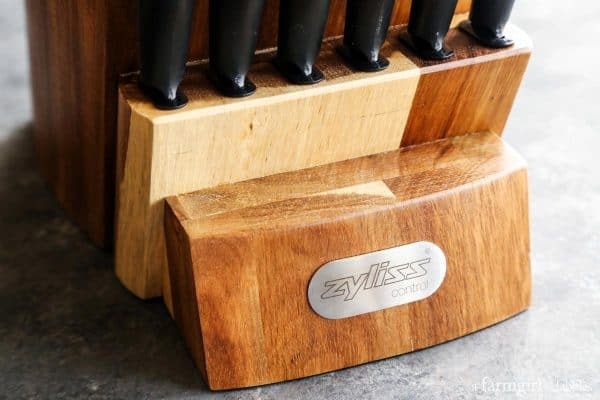 This Zyliss Control 16-Piece Kitchen Knife Block Set with Steak Knives is a beauty, set in a gorgeous acacia wood block. 1. Control – People want to be able to hold a knife securely without fear of cutting themselves. These knives accommodate various grip styles, with non-slip grip touch points on the handles for added stability. 2. Comfort – Because a person’s choice in knives is personal. Everyone wants to feel comfortable! 3. Cleanliness – These knives are easy to clean (dishwasher-friendly!) and resistant to bacteria build-up. You can even remove the knife sheaths from the wood block and pop them in the dishwasher. My family has found these knives to be a great addition to our kitchen. They are strong and sturdy, extra sharp, and extremely comfortable to use. We especially like to reach for the 5″ Santoku, the most used knife in our block. Fun fact for you. Zyliss believes in the quality of their knives so much that they guarantee them for 25 years. To try them for yourself, go here and use promo code “control2017” for 20% off all Zyliss Control knives through the end of March 2017. I’m not going to try to deceive you by saying this salad comes together without any effort. Chopped salads do take prep. You need to make friends with your cutting board and a good, sharp knife or two. But with beautiful, colorful produce like this, a fresh chopped salad is a fun kitchen project with HUGE reward. 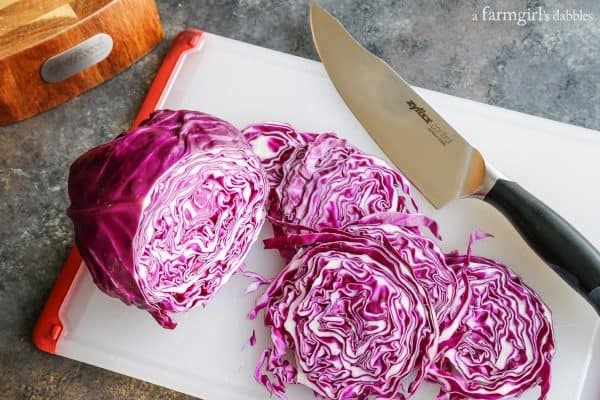 One of my favorite sounds in the kitchen is a big sturdy chef’s knife slicing through a head of fresh cabbage or lettuce. Each cut shouts out the crisp and juicy deliciousness that’s soon to be enjoyed. The coconut green curry dressing is huge on flavor, with a little bit of a kick. Just how I like it. I can almost drink this stuff straight. 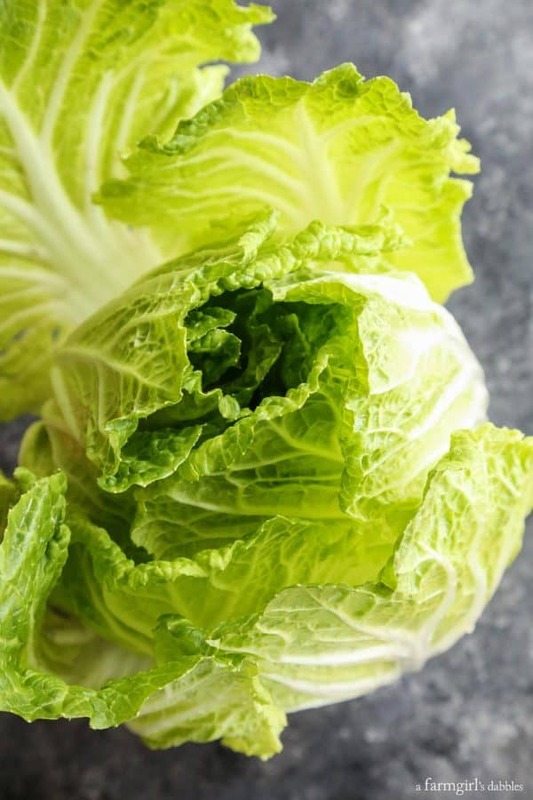 This dressing works great for many different salads. I also like to sauté chopped onion, garlic and a couple sweet bell peppers in a skillet, add a few handfuls of cooked and shredded chicken, and then use this dressing as a flavorful sauce. The mixture is beautiful over a bowl of steaming rice. Vibrant. Fresh. Beautiful. This is my kind of perfect lunch. 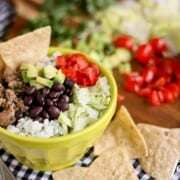 Add all ingredients to a large serving bowl and toss to combine. Drizzle with coconut green curry dressing and toss again to combine or just serve dressing on the side, for guests to add as little or as much as they like. 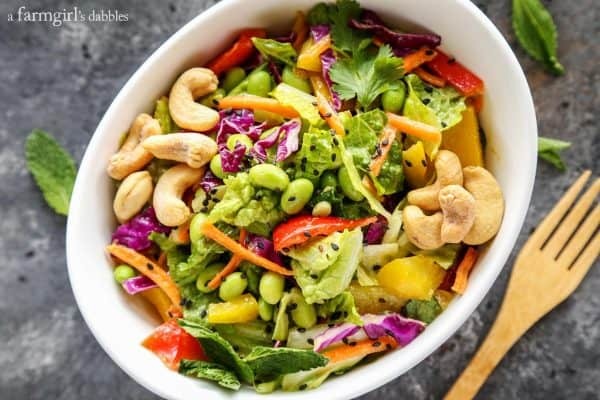 Sprinkle sesame seeds over the top of finished salad. Add all ingredients to a small to medium-sized bowl and whisk to combine. Or add ingredients to a pint jar, cover, and toss to combine. Dressing could be made a day or two prior to serving the salad. Keeps well in refrigerator for up to 5 days. This post is sponsored by Zyliss. All opinions are 100% my own. Thank you for supporting the brands that help make this site possible. There are Amazon affiliate links in this post. 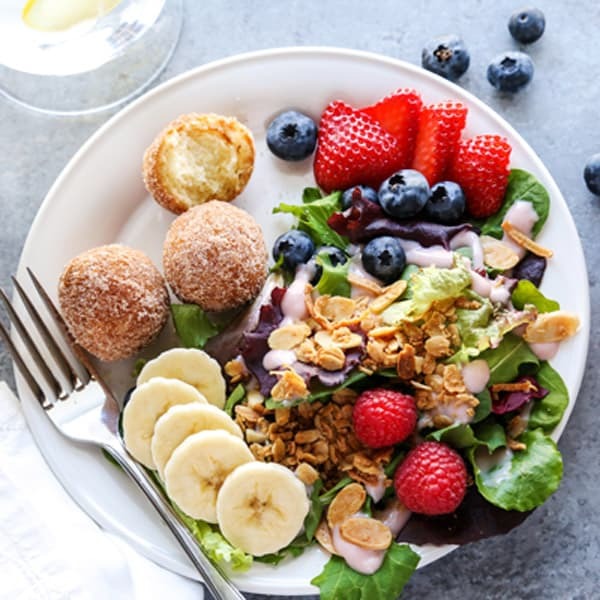 Has anyone actually made this salad? Frustrating that all the comments are from people saying the salad “looks good”. I just did, the dressing is to die for. Great crunch and mouth feel. A bit of kick from the curry paste. I love this salad! 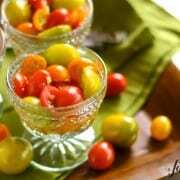 This is really amazing and wonderful recipe in fact healthy too. I love this thanks for sharing this blog. 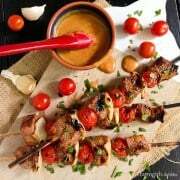 Excellent recipe with superb photos! I’m all about hearty salads this time of year (when I can’t decide if we’ve moved to spring eating or not). This dressing… all over that beautiful creation. I’d like to put that on everything. Where did you get those beautiful bowls? Sur la table! On the bottom of the bowls, it says “Sur la table”. 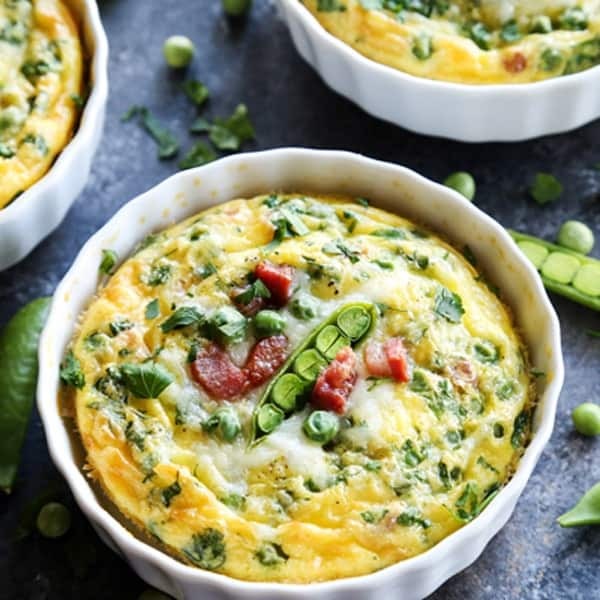 This is the perfect weekend lunch, love everything you’ve got in there! This looks and sounds amazing. Perfect lunch or even a light supper. Those knives are beautiful!! Also I’m in love with that dressing! 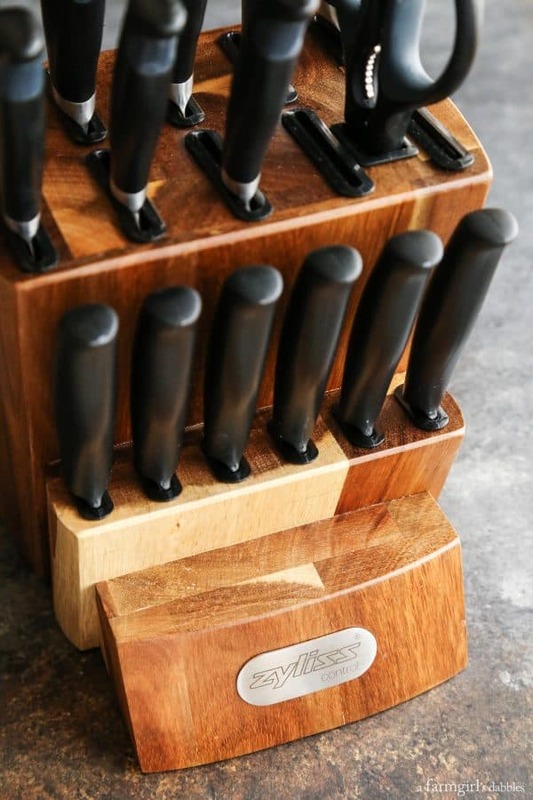 This knife block is great!! And the dressing too!! Thanks Angie. Zyliss has so many great products, including these knives. Thanks Tessa! Love this Brenda! It looks amazing. And I totally agree, slicing veggies with a sharp knife is such a therapeutic kind of thing! Thank you so much, Debs! Perfect for spring. I love this salad, thanks for sharing it! Yes, it does – fresh and colorful always wins! Thanks Mary France! This sounds so tasty and healthy! Santoku knives are my favorite. I’ve never heard of Zyliss before but they sounds like they’re really great quality! I love a good chopped salad. And those knifes look like they’d work well for all that chopping! hey girl- this looks so good! Yummy! Thanks Shawnna – have a great day!! That dressing sounds SOOOOO BOMB! 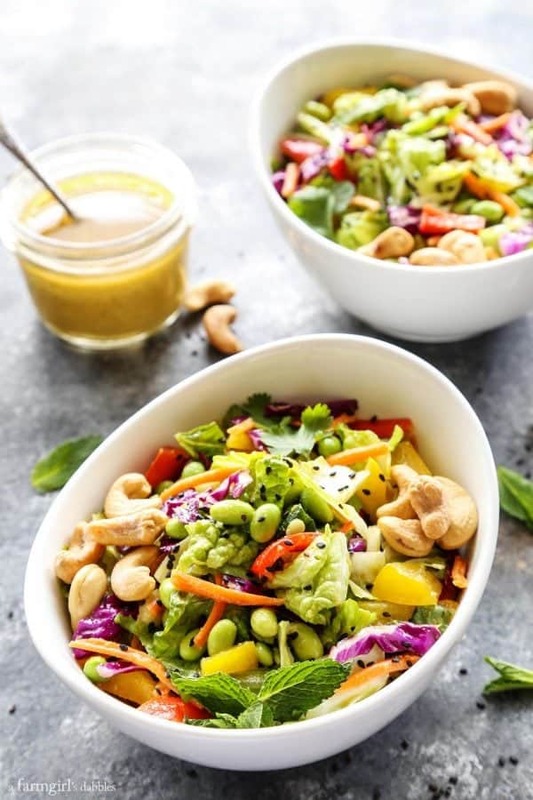 I love green curry and coconut so this salad is totally happening this week! The dressing is fantastic – I hope you like it too! Thanks Taylor! 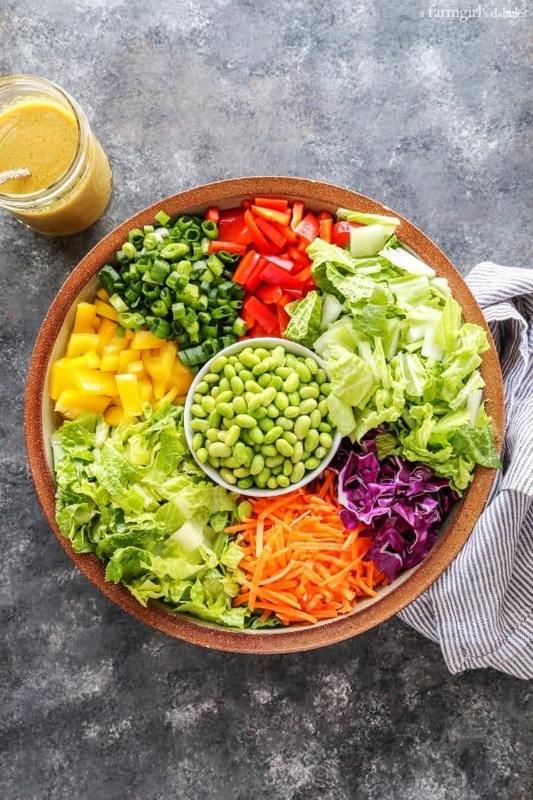 Love all the colors in this salad. And the cashews and coconut curry sauce are a big hit with me. Ohmygoodness. You’re so right that every single slice reveals art in vegetables. I am in love with this combination. 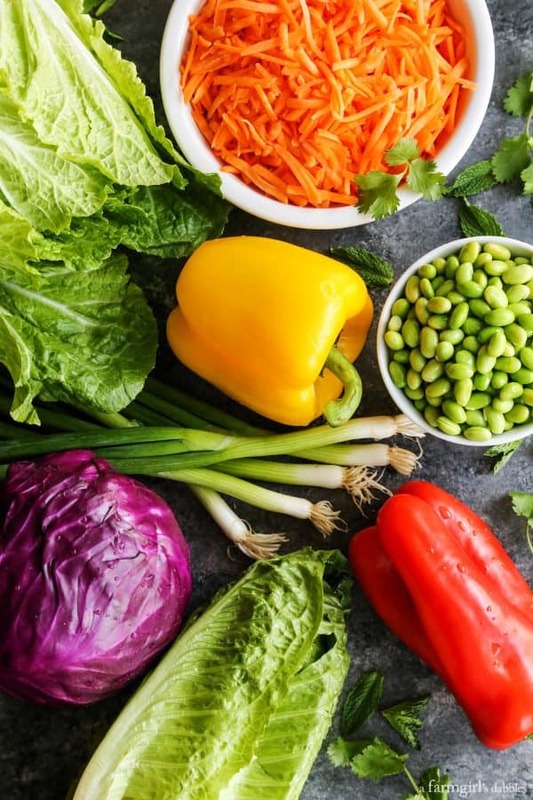 The red cabbage, edamame, and everything else? 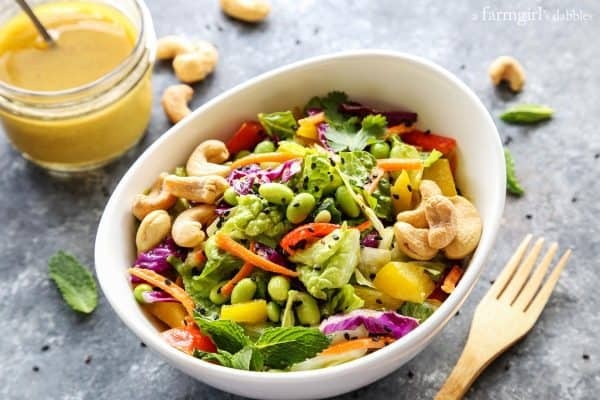 That green curry dressing? I swoon! Isn’t it all so pretty?! Thanks, Rebecca! This salad sounds delightful!! 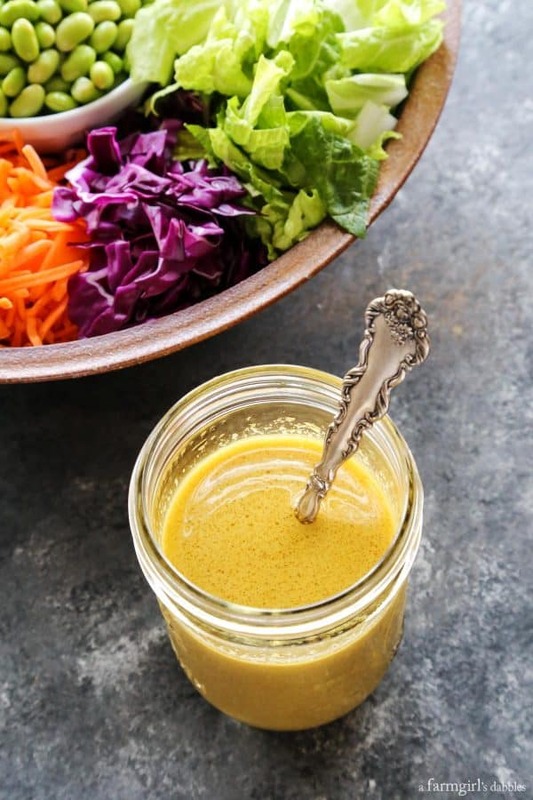 And the green curry dressing…yes, please!